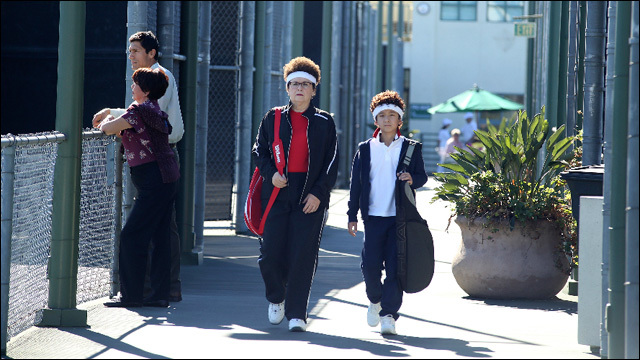 Episode 212: "Michael Chang Fever" airs Tuesday, February 23, 8:00pm on ABC. ABC's hit Asian American family sitcom Fresh Off The Boat airs Tuesday nights at 8:00pm. The comedy, inspired by the memoir of chef Eddie Huang, tells the story of the Huang family, a Taiwanese American family getting their immigrant hustle on in 1990s suburban Orlando, in pursuit of the American dream. If you missed this season's episodes, they're available for viewing on the ABC website. Fresh Off The Boat stars Randall Park as Louis, Constance Wu as Jessica, Hudson Yang as Eddie, Forrest Wheeler as Emery, Ian Chen as Evan and Chelsey Crisp as Honey. With special guest assist from Lucille Soong as Grandma Huang. This week, Michael Chang Fever takes hold of the Huang family. The legendary Billie Jean King becomes Emery's tennis coach! Louis and Jessica learn that Emery has great potential to be the next Chinese-American tennis super star. But after hiring tennis legend Billie Jean King to take Emery to the next level, they realize she may be taking the training too far. Meanwhile, Eddie helps Evan pay off a gambling debt. Guest starring are Billie Jean King as herself, Trevor Larcom as Trent, Evan Hannemann as Barefoot Dave, Dash Williams as Brian, Prophet Bolden as Walter, Isabella Crouch as Alison and Cleo Fraser as Stacey. "Michael Chang Fever" was written by Sanjay Shah and directed by Bill Purple.